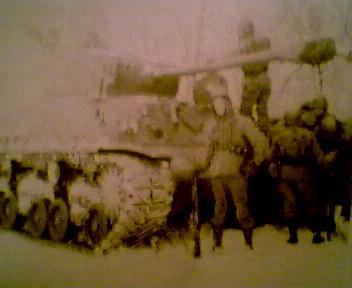 I first became aware of my fathers' experience in Korea during the early 1970's when I was a kid. Hanging upstairs in the far corner of a closet there was a khaki uniform with medals on it and on a hook in the basement a field jacket with a brilliant Indianhead patch.Curious like any young kid I would from time to time ask him about the war. Usually he wouldn't say much, commenting on how they gave them pork chops for the Holidays or something like that avoiding the subject. At that time I really don't think he wanted to remember or talk about it but as time passed we had an understanding and there were times when I knew that Korea was where his thoughts were, a brief few times over the years the world would be put on hold for a few moments and he would talk of the war, usually about a particular incident that had come to mind at that moment. We never did sit down and talk about korea in its entirety rather it was only discussed those times that he was thinking back and I happened to be there. We will never know all of his story because he died suddenly at the young age of 51 and the full account went to the grave with him. The little parts he did tell were so tremendously violent and of such great magnitude it wasn't hard to understand why he didn't want to talk about it. It seemed like it was as painful then as it had been in May of 1951 when his unit was overrun after they had depleted their ability to fight. 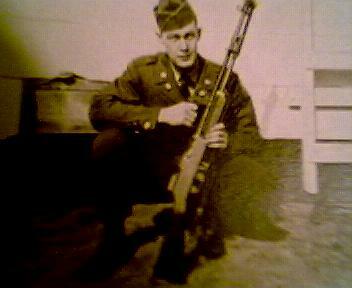 He had been operating a Browning machine gun defending a command post until the 50 cal. turned red hot and malfunctioned. Only one time would he ever talk about cutting down the enemy as they attacked in what would later be described as a human sea. He started telling me once about the hand-to-hand fighting that followed but he stopped partway and we just never talked about that again. Sometimes he would go into more detail when recalling an incident and other times not. 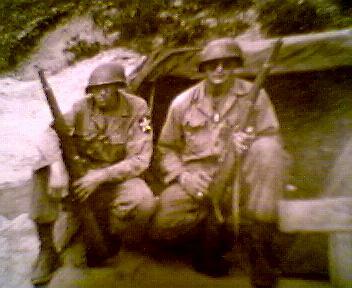 I was with my Dad once sitting on our back porch when a fellow from town came out and asked him if he would speak about his experience in Korea. My dad just shook his head and nicely said, "no". For the most part he did not talk about it much and when he did it was to stress the point that it had been horror, He had mentioned on one occasion the aftermath of battle where an estimated four thousand dead and wounded enemy casualties lay on the field, many still alive, some looking to be as young as twelve who were mortally wounded holding pictures up of their loved ones, others emptying the money out of their pockets and yet others weilding a hidden pistol for a few last moments of combat. In his letters to his sister that were written while being reorganized in In-Ji just days after the massacre he writes telling that the hardest part was leaving wounded friends behind whom they could not carry during combat. It isn't hard to understand how this story became forgotten, In the 1950s it was not socially acceptable to speak of violence of this nature making it difficult to convey an image of how it truly was. He seemed indifferent to the task of war as if it were a job he was called upon to do and after it was done and over with I think he felt it was best forgotten in order to get on with a productive life. It was from these brief conversations with my father that I began my interest in the May Massacre at Chaun-ni in 1951. I do know that he felt a strong tie to his friends and comrades whom were killed during the massacre. It's evident in the final verse of a poem he favored, "Flanders Fields". " If ye break faith with us who die, we shall not sleep though poppies grow in Flanders Fields". It is estimated that HQ company of the 23rd Regimental Combat Team lost 90-100 of its original 117 enlisted men on just one day of the fighting alone. The 23rd regimental combat team as a whole took equally harsh casualties, on their first attemt to re-organize only 74 out of 2200 could be found. The battlefield can be toured now and also the vicinity of Chaun-ni, its known today as Massacre Valley where the 23rd RCT took heavy losses. There is a small schoolhouse there and its said the terrain has changed little and hill 1051 looks much the same. If any of the previous information stated in this site appears to be incorrect or if you in fact have precise numbers and statistics. please contact my email. The casualty reports vary in all the research material making estimates difficult and I am not stating that any one figure is correct but with the information available they are the best that can be at this time. This site has been edited by a number of veterans who survived the May Massacre. To them goes out my many thanks.